Outside, the scent of woodsmoke and roasted ‘roo meat; inside, editioned etchings and the colourfully stitched soft sculptures that have become the signature work for Yarrenyty-Arltere Artists from Larapinta Valley Town Camp in Alice Springs. Everywhere, excited children and then after dark, as they settle down, the screening of films that give you a glimpse of everyday life at the camp as you warm up with a steamy cup of tea and hot damper and jam. It’s that time of year again (next Wednesday, June 13, from 4.30pm) when the town camp hosts the annual Art, Film and Music Night at its Learning Centre. There’s always an atmosphere of celebration. That’s partly in recognition of the centre’s achievements over the year, but it’s also a response to the opportunity for the town and camp to come together, people getting to know one another – being shown how to cook ‘roo tail in the hot ashes, talking about the art, laughing at the same jokes in the films, which perhaps contrary to expectations, are often very humorous. This isn’t the occasion for the art centre to launch new editioned prints – you’ll have to wait until Desert Mob for that – but work from older editions will be for sale. Meanwhile, each soft sculpture is unique and it will be an occasion to buy or admire more of their delightful birds and dolls. 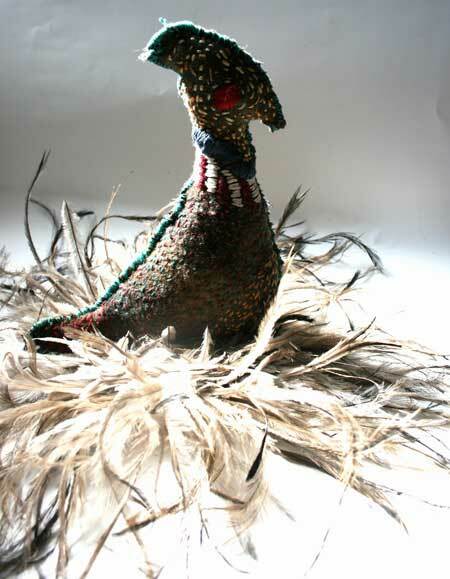 These works continue to attract serious attention, having been the subject of a number of exhibitions these last 12 months, and a work by Rhonda Sharpe, Nightbirds (a group of three) is a finalist in the National and Torres Strait Islander Art Awards, the first time a Yarrenyty-Arltere artist has been a contender in the awards. Another staple of the art centre is silk dyed with natural pigments from eucalyptus leaves, native mistletoe, barks, and native mushroom powders (also used to dye the recycled blankets used for the soft sculptures). To date the silk has been presented as scarves but artists are now also working with sarong lengths that can be used as wall hangings. Larapinta Valley Town Camp is at the end of Blain Street, off Larapinta Drive. The Learning Centre is not far from the entrance, you won’t miss it – it’s where the crowd will be. Pictured, top left: Small circle doll by Constance Robinja. • Top right: Bird by Dulcie Sharpe. • Above: Bird in emu feather nest by Dulcie Ragatt. Photos courtesy Yarrenyty-Arltere Artists.